For the exhibition Treasure (2003) I wanted to tell the story of A Wedding Ring. The ring was meant to be placed on its own in a show case, and alongside there would be a transcript of an interview with the owner. I asked a colleague to lend me his wedding ring, but things did not go quite to plan. Firstly I had to hang it on a ribbon around my neck so that I didn't lose it on the way home. Then I decided it felt wrong (too intimate) to have it inside my shirt next to my skin, so I hung it outside my clothing. Then this felt too exposed, so I attached a safety chain to the ring and pinned this to my clothing as well. Finally I received a questionnaire back where someone had written about never taking his wedding ring off "because it would get cold". This initiated the Wedding ring warmer (pattern below). In the Treasure exhibition this wedding ring was never actually seen, because it was smothered by a knitted warmer, a safety chain and a ribbon. Cast on 15 (20) stitches. Knit across first row, turn. Purl across second row, turn. Repeat these two rows (stocking stitch) until work measures twice the depth of the wedding band; approx. 5 (8) repeats. 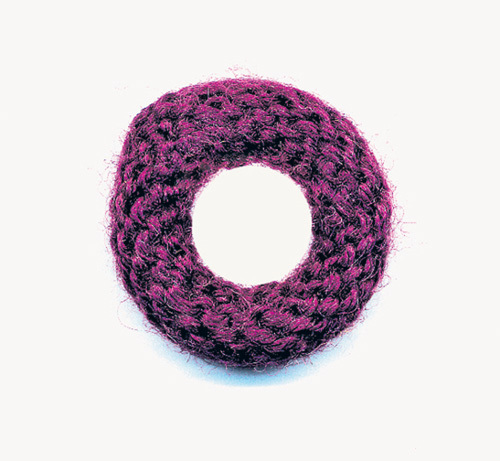 Turn work into a ring shape (knit side facing) and seam neatly. Optional: Leave sufficient wool attached to work to crochet a loop for hanging.